17. Painting (?) by David,1792 (? ), in dress and theatrical pose of a deputy; said to have been done, like No. 16, for the Duplays. 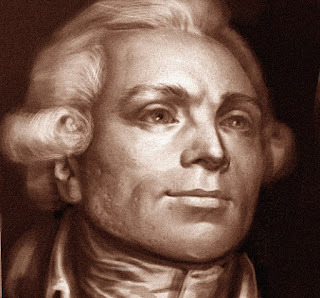 See: Annales révolutionnaires, vol.10(5), p.696: "Portrait of Robespierre by David" - described as the head of Robespierre in pastel, showing his dark, almond-shaped eyes, melancholy smile and regular teeth. Buffenoir, vol.1(2) p.260-1, plate 13. For once there is a clear answer on the status of this portrait. Not Robespierre! In 1988 the painting was cleaned and the identifying inscription found to be an addition. The figure itself had been over-painted in order to make it look more like Robespierre. The newly cleaned portrait is a fine one, but the sitter is at present unknown. Buffenoir AR vol.1(4) p.646-7. Plate 31A: "An imperceptible smile, hardly found elsewhere, reveals a joie de vivre, but the image is fundamentally seriousness and commands respect." 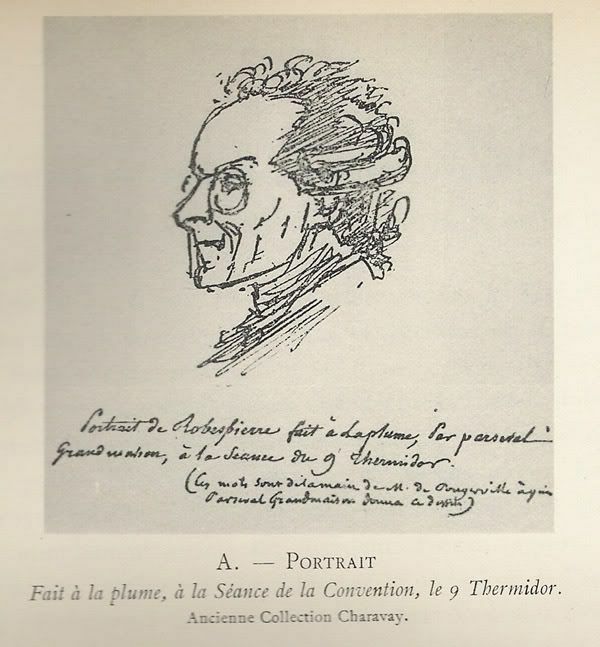 One of the first mentions of Robespierre as 'the Incorruptible'"
A physionotrace portrait of Robespierre "after a drawing" by Jean-Baptiste Fouquet; right profile. 6 cm. Compare no. 42, which is possibly the original drawing.The heavy shading around the eye is characteristic of the physionotrace process. 20. 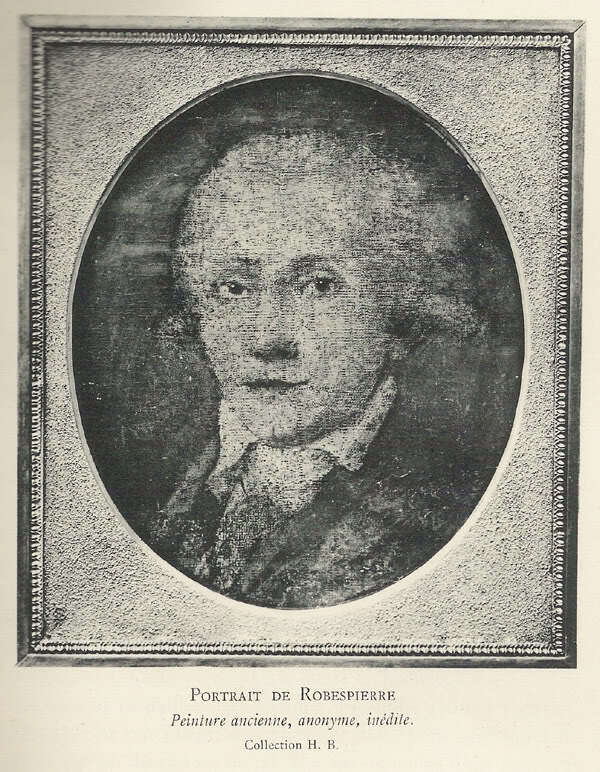 An anonymous oil painting of 1793(?) given by Clémenceau to the Carnavalet Museum. 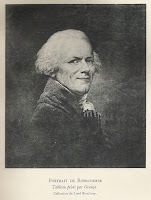 Buffenoir, AR vol.1 (2) p.260: "The dominent expression is energy; it is the Robespierre of the great battles of the Convention." 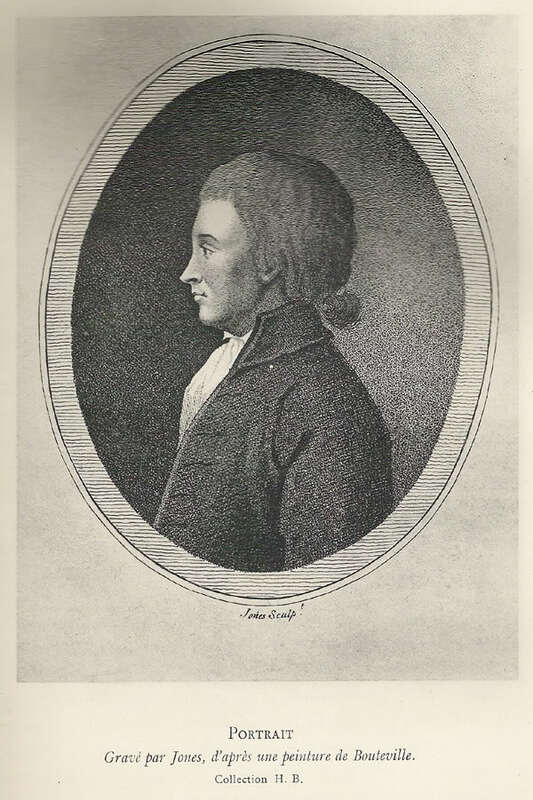 Buffenoir does not include a plate, but I think it is this portrait which is reproduced on several internet sites from old books. I don't know whether it is still in the Carnavalet collections - I can't find a modern reference or a coloured picture. In any case, it does not look to be a very high-quality painting, though it is clearly Robespierre. AR vol 1(2) p. 262-4; plate 15 An important image, known only, I think, from Buffenoir's reproduction. 22. Oil painting (?) of 1793 (?) by Ducreux (? 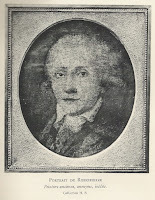 )in the collection of of M.G.C.-L., supposed to have been shown at the Salon of 1793. Buffenoir, vol.2(3),Appendix p.388. Plate 9. 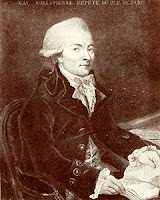 Buffenoir describes this picture as in the collection of M.Gaston Calmann-Lévy; his identification with the portrait exhibited at the Salon of 1793 is only speculative. 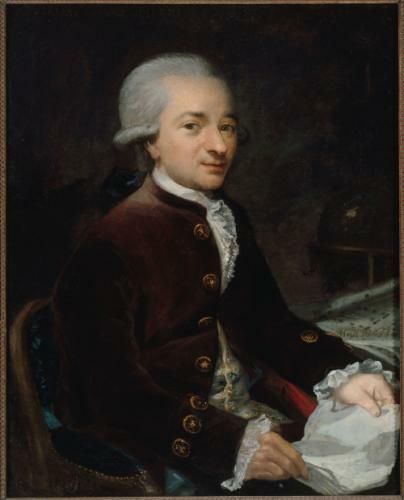 The Dictionary of Pastellists lists three different Robespierre portraits by Ducreux, the first of which is the portrait sold by Sotheby's in 2003. 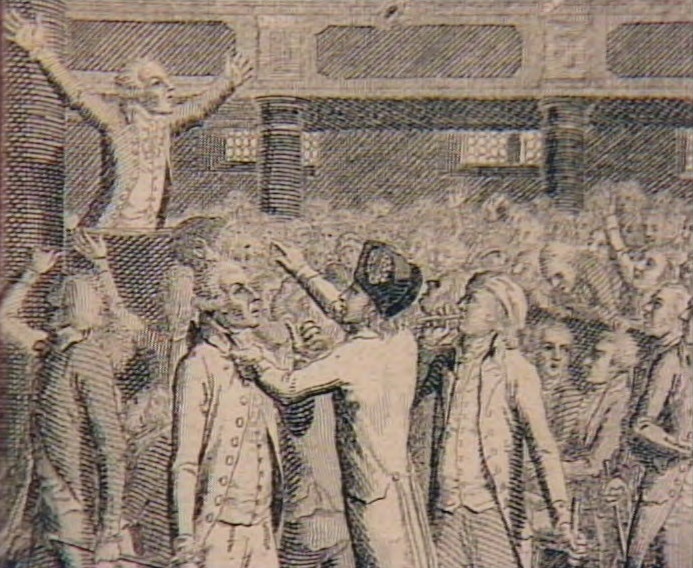 A second picture is documented as a chalk exhibited in 1793. This just cannot be this portrait - the sitter simply isn't Robespierre. See Buffenoir, AR vol.1(2) p.233. Engraving on wood showing Robespierre at the Jacobins Signed A.W. Kugner 1793. 24. Oil painting by Greuze, 1794, bought at Lord Lonsdale's sale, and now in Lord Rosebery's collection. A fine portrait but is it Robespierre? There is no information as to present location. 25. Oil painting by Boutteville, in England (?) 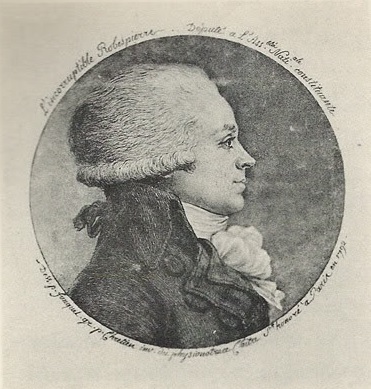 engraved by Jones, in 1794 as "Robbespierre"
Buffenoir, AR, vol.1(2), p.255-6. Plate 6. 26. Oil painting by Fragonard, 1794, reproduced in A.R. 1/257. (Nearly full face, in damaged condition) Is it Robespierre? Buffenoir vol.1(2), p.262. Plate 14. This is an anonymous painting which was in Buffenoir's own collection. 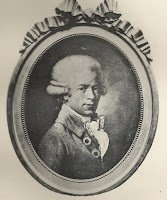 Buffenoir in fact only claimed that the style is reminiscent of Fragonard. Current whereabouts unknown? ....dress and hair are unlike him. See Pierre Marcel, "Contribution à l'iconographie de Robespierre", Annales révolutionnaires, 1912, vol.5(1): p.37-40. Bought by the chemist F.-V. Raspail in Brussels in 1852 or 1853; in 1912 it was in the collection of the museum founded by Raspail in Arcueil-Cachan. Felix Maria Diogg (1762 –1834) was a Swiss painter. 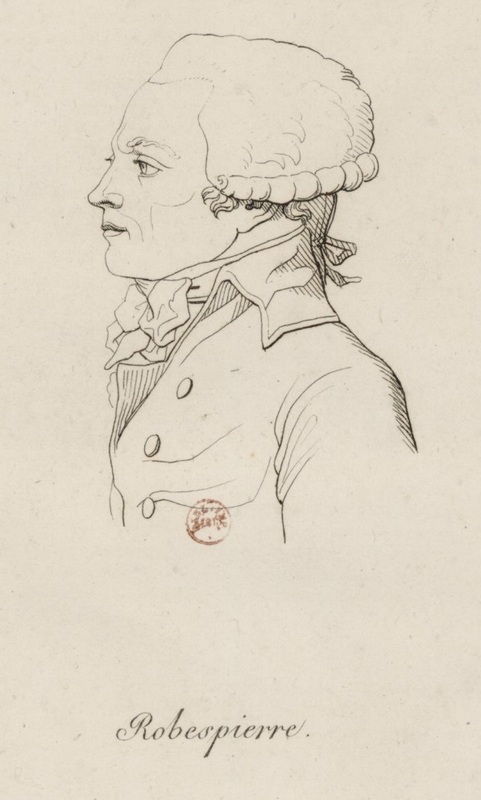 A Robespierre with sideburns?! ! 28. Pen and ink sketch by P. Grandmaison, done in the Convention on July 27 (9 Thermidor) 1794. By François-Auguste Parseval-Grandmaison. From the collection of Étienne Charavay; now in the BN. 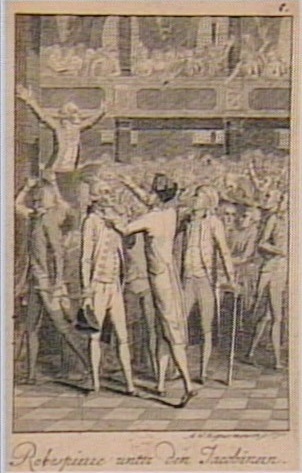 The annotation reads "Portrait of Robespierre made in pen by Parseval-Grandmaison at the sitting of the 9th Thermidor. (These words are in the hand of M. de Longueville, to whom Parseval-Grandmaison gave this drawing)." 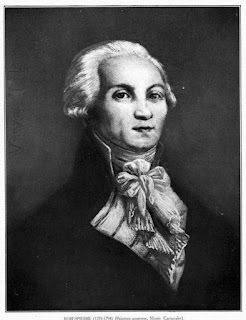 Buffenoir vol.2(3),Appendix p.389: Buffenoir suggests this is possibly the last portrait of Robespierre apart from the sketch by Grandmaison on 9 Thermidor. 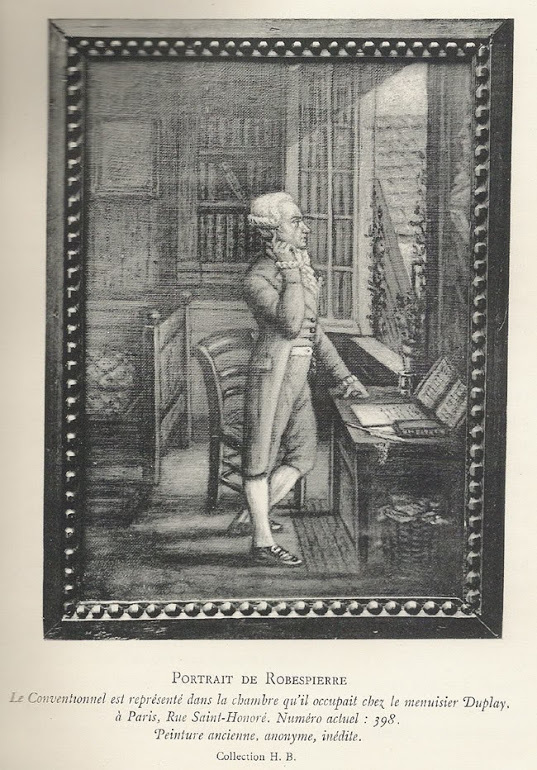 Buffenoir's description sounds like this engraving in the BN. 25. Probably Augustin, mislabelled. The nose is more like his. That Sheffield picture looks to me as if it's just a random teenager. I'm not even sure it can be claimed to be a French painting. 17. 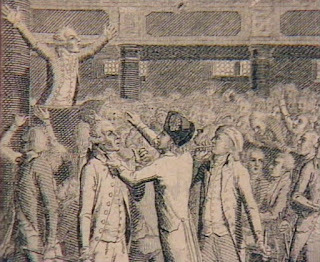 The description with rapturous expression and visible teeth sounds suspiciously like a prepatory portrait-sketch for David's 'Tennis Court Oath'. It would be marvellous if it could be found. Do you think you love Robespierre a little too much...? I'm just very excited about all the iconographic fun to be had! I'm captivated by physionotraces, technically as well as artistically. I love artistic puzzles: misidentified portraits, missing portraits, tracking things down!